Jindal Stainless Ltd., one of the largest stainless steel conglomerates in India, recently added a family planning intervention to their corporate social responsibility program. Jindal Stainless Foundation invested 819,500 Indian rupees (US $12,800) for a project aiming to reach 1,000 beneficiaries with better family planning information and counseling services. Photo courtesy of Jindal Stainless Ltd.
Advance Family Planning (AFP) held a diffusion workshop on June 19-23rd in Uttarakhand, India—the first in a series to be held in different regions where AFP works. The five-day workshop aimed to build facilitation skills in applying AFP’s SMART (Specific, Measurable, Attainable, Relevant and Time-bound) advocacy approach as well as provide participants with the opportunity to develop a SMART advocacy objective to implement. In June 2017, Indonesia’s provincial government of West Kalimantan allocated IDR 470 million (US $35,300) of its own funds to scale up 14 family planning advocacy district working groups in 2018—12 of which are newly formed. This win for sustainable, locally-funded advocacy builds on years of efforts to improve information and services for couples in West Kalimantan. In a sign of Burkina Faso’s dedication to family planning, the Minister of Health appointed Anne Thieba, wife of Prime Minister Paul Kaba Thieba, as an ambassador. Mrs. Thieba’s appointment comes as Burkina Faso finalizes its second family planning costed implementation plan aiming for a contraceptive prevalence rate of 32% by 2020. This significant show of political support will help the Ministry of Health and its partners intensify efforts. In May 2017, the Partnership for Maternal, Newborn & Child Health and Women Deliver launched the Advocating for Change for Adolescents! toolkit. 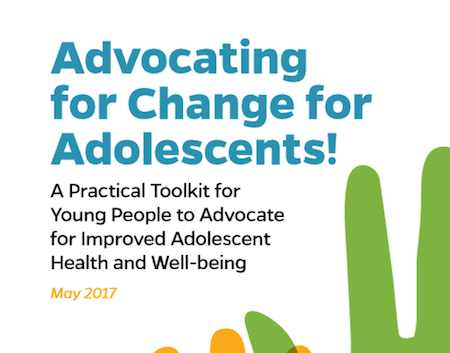 Developed by young people, for young people, the toolkit is a practical guide for in-country youth networks to design, implement, and monitor an effective national advocacy action roadmap on adolescent health and wellbeing. 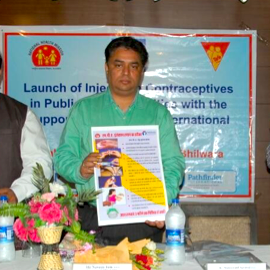 Rajasthan became the second state in India to provide injectable contraceptives (intramuscular DMPA) free of cost in 132 public health facilities on May 27, thanks to a public, private, and non-profit partnership. As of May, three more drugs are included on the essential drugs list for Rajasthan state in India, ensuring that they will be available at the primary health center level. 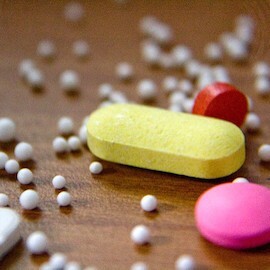 These drugs are vital for new injectable contraceptive users. The addition to the list was achieved in time for the May 27, 2017 roll-out of injectable contraceptive services at Rajasthan’s primary health centers. Two districts in India’s Rajasthan state established counseling corners in local public health facilities in April. The private, dedicated counseling spaces ensure that clients can make informed decisions regarding family planning. For the first time in Jharkhand state, two districts established family planning counseling corners at 13 community health centers. Established between January and March in Bokaro and Ranchi districts, the counseling corners are dedicated spaces for a skilled provider to provide quality family planning counseling to clients. Twenty Senegalese mayors committed to invest a total of 21.5 million FCFA (approximately US $37,700) for family planning for the women in their communities. The government of Burkina Faso’s new three-year costed implementation plan for family planning increased activities dedicated to adolescents and young people to 30% of all outlined activities—compared to the 14% of activities in the 2013-2015 plan. This significant increase means that Burkina Faso is aiming well beyond the target set by the Youth Think Tank of the Ouagadougou Partnership in 2017: for 15% of activities to focus on youth.